I’ll admit, I went into Thriller Live with trepidation and low expectations. The show arrived on the West End in the wake of Michael Jackson’s death and a whole host of other jukebox musicals, a movement that has since been ridiculed. Yet with the show now celebrating its 6th anniversary (becoming the 20th longest running show in the West End), surely it must have some merit to have lasted so long? And will MJ fans appreciate it more or less compared to the average theatre goer? Thriller Live is better than other jukebox musicals in that it’s not really a musical. This isn’t a biopic of his life (though the song order does follow a loose timeline of his career), nor does it shoehorn his music into a dire, clunky narrative. Instead the show has the feel of a pop concert, with five lead performers singing his songs backed by dancers and the audience encouraged to sing and dance along. This is far from a high-brow musical filled with Sondheim-loving geeks sat in silent appreciation (something I’ll gladly admit to myself – I’ll be damned if somebody opens their mouth if sat near me), but it’s an evening of pure fun. Of course, song choice is of paramount importance here. There have been some changes over the years – swapping the saccharine Heal The World in favour of the sublime Earth Song was an excellent decision – and the setlist doesn’t stick solely to the biggest hits, thankfully including Dirty Diana (the superior femme fatale song to Billie Jean) and the hugely powerful They Don’t Care About Us. There’s also some re-arrangements – a copy of The Way You Make Me Feel from This Is It, and Dangerous from his 1995 MTV Awards performance. That said, by following his career, the show gets off to a slow start with his early days in the Jackson 5, his best material (from ‘Thriller’ onwards) crammed into the second half. This isn’t helped by the performers taking some time to settle into the show. As such, ‘Bad’ and ‘Dangerous’ are sadly under-represented and other favourites are missing including Human Nature (despite being listed in the programme). With the emphasis on the music, it’s a shame that visually the show is a little staid. The use of screens and lighting add some pizazz, but set-pieces are few and far between. The images of real life heroes during Man In The Mirror also feels hackneyed. Mostly, though, it’s the dancing that disappoints. For starters, original choreography isn’t always used – why the change? Further, many of the dancers looked like they were merely marking the moves, barely cracked a smile and often weren’t totally in sync with each other. Michael’s dancing was all about energy, sharpness and intensity – all of which were missing during this performance. Watch the dance auditions on This Is it to see how it should be done. It’s left to the singers to pick up the slack and the results are a little mixed. Ramon Mariqueo Smith is exceptional as the young Michael; understudy Michael Kavuma lacks stage presence; and whilst John Moabi has a beautifully soft falsetto tone, too often his performances slip into sound-alike karaoke. Jesse Smith (narrowly upstaged by his own lengthy hair) brings a raw rock intensity to the show and his rendition of She’s Out Of My Life is genuinely touching. The performances suffer from imitation, however, which is why Cleopatra Higgins is the undisputed star of the evening. Her vocal ticks may mimic Michael’s, but her voice is simply outstanding. Moreover having a female singer avoids a copycat performance, adding a new dimension to the songs. Then there’s David Jordan, who sadly represents everything the show shouldn’t be. Nobody but Michael Jackson can be Michael Jackson – Jordan just comes off as a poor impersonator. He may have the moves, but he lacks the attitude and the energy. By comparison to the real thing, he’s just going through the motions. His delivery of the aforementioned MTV ‘Dangerous’ performance pales next to the original. The show is undeniably best when it’s able to put a new spin on the familiar, but mostly it's lacking the spirit of Michael. Where he was known for his effortless cool and cutting-edge modernity, Thriller Live smothers everything in a thick layer of West End cheese. The real heroes of the show, then, are the band. Frequently revealed on-stage, their slick playing recreates the original sound with a few welcome flourishes of their own. Unlike other jukebox shows, there is simply not a bad song on the setlist (except, you know, Bad). 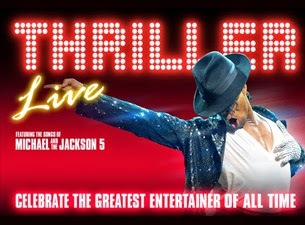 The King of Pop may not be king of the West End, but if Thriller Live is anything it’s an enjoyable tribute to the greatest entertainer in history and the undeniable power of his music, no matter how it’s performed. Watch: Thriller Live runs at the Lyric Theatre.